Nobody makes epic films like director David Lean. Massive in scope, yet photographed with an artist's eye for detail and beauty, Lean's movies take viewers on unforgettable journeys, immersing us in exotic, mystical settings and delving deep into foreign cultures. Doctor Zhivago, The Bridge on the River Kwai, and A Passage to India remain stellar testaments to the director's brilliance, but nowhere is his talent more gloriously on display than in Lawrence of Arabia. With consummate skill, Lean tells a sprawling historical tale, yet never ignores the intimate human elements that give it power and resonance. T.E. Lawrence was a complex, controversial figure, and Lean (aided by the literate Robert Bolt-Michael Wilson screenplay) subtly weaves his strengths, neuroses, and unshakable beliefs into the film without detracting from the action at large. Many argue that Lawrence of Arabia stands unrivaled as an adventure epic, but it works equally well (and possibly better) when viewed as an epic character study. Few directors would dare devote almost four hours to the escapades of a reckless, pig-headed egomaniac, but Lean's audacity rivals that of Lawrence himself, and he achieves the same spectacular results. He paints Lawrence as a mythic, larger-than-life figure who makes his own destiny and demands others follow suit. Yet Lawrence's motivations remain suspect, and throughout the film we search for clues to unlock the mysteries and secrets lurking within his enigmatic frame. There are no easy answers; in fact, there may be no definitive answers at all, which makes Lean's film all the more fascinating. Beginning with Lawrence's death in 1935, the film uses cryptic comments from colleagues and associates as a springboard for flashing back to the origins of Lawrence's Arabian ties. Itching to unchain himself from a Cairo desk job during World War I, the young British lieutenant (Peter O'Toole in his film debut) finagles a mission to meet up with the Saudi Prince Feisal (Alec Guinness) to discuss the ongoing, yet disorganized, Arab Revolt. Lawrence believes uniting the sparring Arab tribes against their common Turkish enemy would also ultimately aid the British in their quest to halt German aggression in the region. With the help of tribal leader Sherif Ali (Omar Sharif), whom Lawrence wins over with his arrogance and moxie, Lawrence convinces Feisal to donate troops to the cause. Over time, the British officer gains the Arab guerillas' respect, especially after engineering a treacherous and triumphant surprise attack on the Turkish-held port of Aqaba. Lawrence basks in the ensuing idolatry, but such heady success breeds a false sense of invincibility that taints his future actions and forces a crisis of character. The fact that O'Toole was eleven inches taller than the five-foot-five-inch Lawrence (and infinitely more dashing) makes him no less able to embody the man's conflicted, puzzling personality. O'Toole's steely blue eyes seem to color Lawrence's view of the world, allowing him to dream his impossible dreams, yet also shielding his inner darkness and complexity from those closest to him. His soft manner and economy of speech cast a mesmerizing spell, and with such strong convictions and personal magnetism we never question how Lawrence could unify so many fractured, warring Arab tribes. Like the soldiers he leads, O'Toole consistently commands the screen and we never tire of watching him craft this multi-faceted character. Nor do we tire of the brilliant supporting players, all of whom add texture and fullness to the film without diminishing Lawrence's aura. At first, it's hard not to bristle when Alec Guinness appears in his Arab makeup and costume, but the master actor is intensely believable and one quickly dismisses his native ethnicity. Sharif, Anthonys Quinn and Quayle, Jack Hawkins, Jose Ferrer, Claude Rains, and Arthur Kennedy all make notable impressions as well. Then there's the scenery. Although calling Lawrence of Arabia a mere desert travelogue does the film a grave injustice, the movie captures both the majesty and brutality of sand and rock with unparalleled artistry. Lean's meticulous attention to light and color, shot composition, and his enviable command of the widescreen format produce breathtaking images, despite the oppressive conditions. As a result, the unforgiving desert becomes an additional, pivotal character in the drama. And it's this emphasis on the central elements of story and character�even in the context of massive spectacle�that makes Lean's films endure. Despite its considerable length and vast canvas of locations, ideas, personalities, and events, there's nothing bloated about Lawrence of Arabia. Almost every shot advances the story, creates a mood or exposes a fresh component of character. Lean allows nothing�not even his own genius�to upstage the all-important story. When the movie ends, we may not know or understand T.E. Lawrence any better than when we first saw him, hurtling toward his death on a speeding motorcycle. But with this film�one of the finest in history�Lean proves to us that the journey is far more important than the destination. And Lawrence's Arabian odyssey may well be the journey of all time. 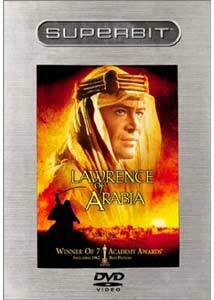 Image Transfer Review: Having never seen Columbia's previous DVD release of Lawrence of Arabia, I can't compare its image quality to this Superbit transfer. But it's tough to imagine a more spectacular effort than what has been produced for this two-disc Superbit set. Is it a perfect transfer? No. But most of the existing problems are not digitally related. The most annoying imperfection�two faint white vertical bars that run the length of the screen during several landscape long shots�reportedly existed in the film's original theatrical prints and could be traced back to the intense heat and light of the desert settings. In fact, many scenic shots possess a slightly pale look, while others burst with vivid color and contrast�obviously the result of the challenging Arabian locations and weather conditions. Close-ups and medium shots, however, crackle with a delicious crispness and exceptional range of color, while day for night scenes look realistic and possess outstanding shadow detail. Fleshtones seem true, and although I could occasionally detect just a touch of edge enhancement (mostly at the crest of some sand dunes), it never distracts or inhibits one's enjoyment of this classic film. Considering that Lawrence of Arabia teetered on the brink of extinction 15 years ago (and was rescued by restoration authority Robert A. Harris, who also provided extensive input for this DVD release), the sharpness, detail and vivacity of this Superbit effort is nothing short of extraordinary. In the current DVD format, it's impossible to believe that Lawrence of Arabia could look any better. Audio Transfer Review: In addition to the DD 5.1 audio option that was included on the previous DVD release, the Superbit Lawrence of Arabia enjoys, for the first time, a DTS track as well. The results are quite good, although, for once, the differences between the two formats are difficult to discern. Both choices provide full, often booming, surround sound (especially during the battle scenes), with a fair amount of ambient effects keeping the rear speakers engaged, while explosions and animal hooves provide deep, solid .1 LFE action. Dialogue is always clear and surface defects simply do not exist. Of course, the most memorable aspect of Lawrence of Arabia's soundtrack is Maurice Jarre's majestic, sweeping score. Once heard, it becomes instantly unforgettable and perfectly compliments the film's story and various moods. Yet when the music kicks in, so does an uncomfortable volume boost that raises the score's level to the brink of distortion. The music also suffers from a thinness of tone that diminishes its impact somewhat, but never its beauty. For a film that predates the widespread use of multi-channel sound, both the DD 5.1 and DTS tracks provide superior, detailed audio, and the enhancements they provide for Lawrence of Arabia far outweigh any minor faults. Thanks to the peerless video and audio treatment this Superbit release provides, Lawrence of Arabia can be seen and heard at home like never before. David Lean's signature epic (#5 on the American Film Institute's list of the 100 Greatest Movies) is a work of supreme artistry and intelligence, and a must-own for anyone who appreciates the art of film. Superior recommendation.